Sweet Princess Bowtique's baby hair bows are the perfect size for your little baby girl, but don't be fooled by their name...girls of all ages love to wear them too!! 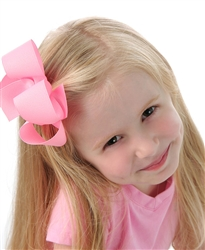 Our baby hair bows are made with premium 3/8" ribbon, measure 2 1/2 wide and are attached to alligator pinch clips. As always, each and every end has been heat sealed to prevent fraying! Sweet Princess Bowtique....expect the BEST for your little princess! !